About a year back, the Indira Gandhi International Airport at Delhi took the solar plunge with a 2.14 MW plant. 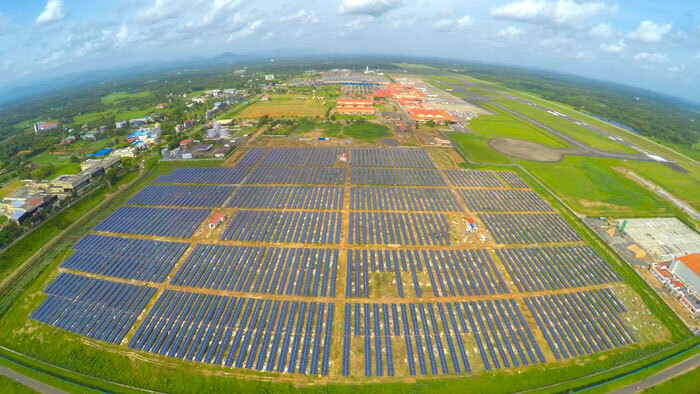 Incidentally, the combined capacity of solar installations at Cochin Airport (12+1.1 MW) is more than the solar PV system installed at the Indianapolis International Airport, which holds the record for world’s largest solar plant at an airport. However, to be fair, Indianapolis has a single 12.5 MW ground-mounted system. According to the German company Enerparc, which had commissioned the Delhi system, the only special requirement for putting up a solar plant at an airport is the glare analysis for the solar panels. Solar glare is a concern among pilots, but technology advancements have led to a substantive reduction in the reflective index of panels. Kolkata’s Netaji Subhas Chandra Bose International Airport, which seems to be the next in line to install a MW-scale solar plant, is said to have sanctioned a 2 MW solar PV unit. Though, if the media reports are to be believed, the airport is eyeing a 15 MW ground-mounted solar power plant over 60 acres of land. The Airport Authority of India (AAI), which operates 125 airports across the country, including the Cochin and Kolkata airports, has decided to build solar power plants at about 30 of its airports. AAI has plans to install 50 MW capacity plants in the first phase (by 2016), which would be enhanced to 150 MW over a period of time. The plants would be established on surplus land available at these identified airports or on the large rooftops of the airport structures. A MoU was signed between AAI and Solar Energy Corporation Of India (SECI) for construction of these solar plants. India has 136 airports, some of which are spread over vast pieces of land. For example, the Hyderabad International Airport is spread over 5,400 acres, while the one at Chennai sits over 4,000 acres. Large-scale solar plants are possible on many of these. The one at Hyderabad, for instance, can house a 25 MW system.